The love of seasonal flavor shows in the way of wearing traditional Kimono too. They come in seasonal colors and patterns. 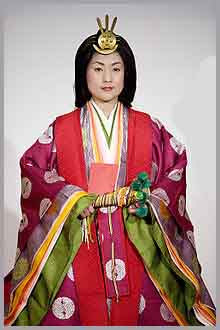 Kimono are the traditional garb of Japan, and they date back well over 1000 years. The garment has undergone many transformations since that time, both stylistically and in the way it's constructed. Kimono literally means "clothing," but usually refers to the traditional wrap-around, full-length, one-piece robe worn by both men and women. During the Heian period (795-1185), the kimono was so splendid that its appearance must have been stunning to say the least. The world's first novelist, Lady Murasaki Shikibu (author of "Tale of Genji," and attendant to the Emperior's court), described in her writings multi layered costumes made of the finest silk. Up to a dozen or more colorful layers of contrasting colored kimono would be worn! As the kimono evolved into outer wear, so to did its potential for creative and expressive design. Kimono became elaborate works of art, sometimes with renowned artists commissioned to paint their surface. Glorious embroidery that utilized gold or silver thread embellished the garments. The Japanese love and reverence for nature was reflected in the themes chosen to decorate kimono. Flower blossoms, trees, and streams were lovingly hand painted onto the surface of the robes. Oftentimes kanji would be incorporated into the designs... bits of poetry or characters alluding to ideas or concepts would be embroidered or painted onto the garment. 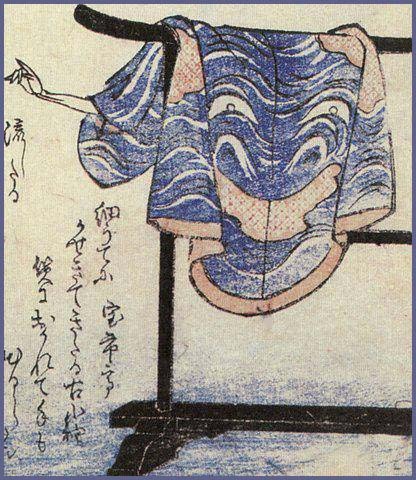 A very intricate dyeing technique was developed called yuuzen. Artwork would be either stenciled or painted directly onto the garment with an organic material (rice paste), which would then dry and harden. The cloth would then be dipped into a dye bath... with the "resist" painted areas refusing the dye. After the stencil painting was removed by washing, a dazzling piece of artwork would be the result. This dye-resist method is still used today in the production of some kimono. Once it became fashionable to wear kimono as outer garments, they were combined with a trouser called, hakama. Around the 15th century, kimono were worn without hakama and this fashion became the standard for both men and women. 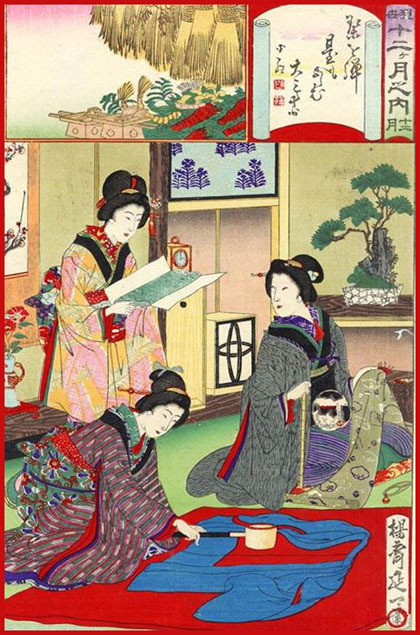 Kimono had become a single layer, multicolored robe with rectangular sleeves, and was secured at the waist by a sash called the obi. The jūnihitoe is an extremely elegant and highly complex kimono that was only worn by court-ladies in Japan. Literally translated, it means "twelve-layer robe". The older term, still used by scholars but not widely recognised in mainstream Japan, is Karaginu Mo (唐衣裳). This is in reference to its Chinese coat (Karaginu) and apron-like train (Mo), the defining parts of the costume. ... The colours and the arrangements of the layers are very important. The colours have poetic names, such as "crimson plum of the spring". Some two hundred rules were established which governed things like the combination of colors of kimono colors and how the colors of the outside and the lining should be harmonized. This resulted in certain colors being associated with November to February which were called ume-gasane or "shades of the plum blossom. Such kimonos were white on the outside and red on the inside. For March and April there was a combination called "shades of wisteria", a kimono with lavender outside and a blue lining. Winter and Spring had their own set with an outer garment of yellow and orange. The colors were set to mirror the seasons and their moods, showing just how closely the Japanese were attuned to the world of nature around them. This also, of course, led to other things one did not do with kimonos, such as wear one with cherry blossom designs in the winter or fall. Examples of summer motifs include ocean waves and red maple leaves. This is an important item, used by ladies to wipe their tears. It is also important in Japanese dance. "a sleeve wet from cold tears"
Or: "his" or "her sleeves." There is a cultural dimension to this haiku that is lost in translation. Shinji Ogawa explains, "The expression tamoto ni sugari or 'clinging to the sleeve' is a typical gesture in the theater for a lover's departure. I think it is Issa's humor to depict the spring's unwillingness to depart. The phrase semaki tamoto implies the work clothes or poor man's clothes." 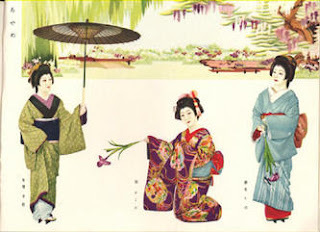 Here are a few kigo with the dresses of Japan. Beginning of April, especially in Kyoto, where many dyers were living. Started in 1930 to revive the traditional arts and crafts of Okasaki, Kyoto. including bleached cloths, sarashi, shrinked cloths, chijimifu and many more. They are used by ladies to prevent the sun from shining directly on the skin. 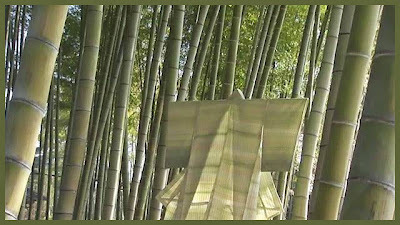 has been weaving kimono from naturally dyed thread for more than 60 years. The traditional Japanese artist was recently awarded the prestigious Kyoto Prize in recognition of her ability to reflect the harmony between humans and nature in her art. But she is concerned that that relationship is changing for the worse.
. kashi kosode 貸小袖 (かしこそで) lending a robe . Kosode no te is a phenomenon appearing in short-sleeved kimonos formerly owned by prostitutes. It is characterized by a pair of ghostly hands emerging from the sleeves and assaulting nearby people. Kosode no te can occur for a number of reasons. One common origin is when a prostitute dies in vain, after working for many years to save up the money to buy her freedom from her owner. Upon death, such women usually had their clothes donated to a temple for prayers to be said over them. However, if the woman was still owed money by her clients when she died, her spirit often reanimated her old clothing, and they leave the temple to find her customers and beg them for the owed money. when, instead of being donated to a temple, a dead person’s kimono is sold to someone else. If the deceased was unable to properly pass on to nirvana upon death, that person’s spirit occasionally comes back and haunts the kimono. 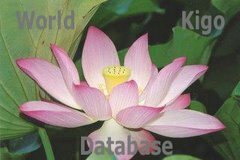 "Spring" is here synonym with the New Year according to the Asian Lunar Calendar. it feels like we met in a past life. .
. yuuzen 友禅 Yuzen past-resist dyeing, . I thank Susumu Takiguchi for helping me to visualize this haiku. 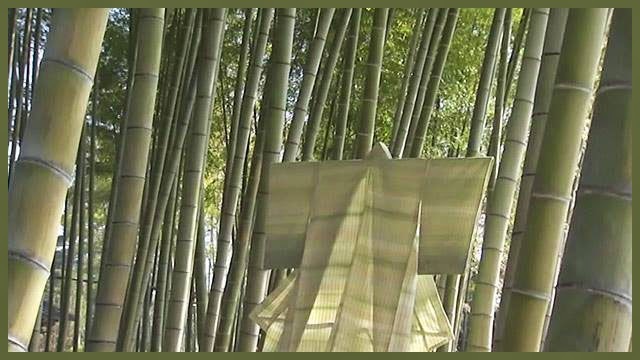 In an e-mail (4/17/01), he explains that the first line, jin-jin bashiyori refers to "an action whereby a man picks up the centre-back of the hem to his kimono and tucks it to his obi sash at the back of his waist. By doing it, his legs would be given freer movement and it is presumed that a man does this when he wants to do something, such as walking a long way as in a walking journey, dancing or engaging in an active action. It is not clear if this noun only refers to old men, or men in general." Shinji Ogawa notes that the Japanese kimono is not well suited for striding or running, and thus needs to be tucked for such movement. Jin-jin bashori (or jin-jin bashiyori) is a relatively easy way to tuck the kimono but it looks untidy; thus it is called "an old man's tuck." This book is a pioneering study of Japanese ornamental textiles made for the foreign market during the late nineteenth and early twentieth centuries. These exquisite embroideries, resist-dyed silks and velvets, tapestries and appliqued works were an important feature of the Western fascination with all things Japanese at that time, winning numerous accolades at international fairs and being used to decorate homes across Europe and the United States, yet since then they have been largely forgotten. This book, which will appeal to textile enthusiasts and those interested in Japanese art and Japonisme alike, celebrates these remarkable and undervalued textiles, discussing their production techniques, iconography, patronage and trade, and demonstrating how Kyoto craftsmen created a modern art form by adapting their traditional skills to Western tastes. The visual appeal and obvious technical virtuosity of the objects will give the book a broad appeal. The collection will then travel to the Kiyomizu-Sannenzaka Museum, Kyoto. for 冬木屋 the Fuyuki family.